Enhance the existing brand through integrated signage/wayfinding systems – Increasing font and signage size, improving font color, providing pedestrian-scale signs and integrating gateways to strengthen identity and to communicate to visitors that they are entering the campus will make an already recognizable brand more effective and the campus more welcoming and easier to navigate. Focus on the “core” for pedestrian connectivity and activity – Concentrating revitalization efforts at hubs of activity, including undeveloped north-side parcels, within the campus core that are within a five to 10 minute walk and accessible through a series of trails and on-street pedestrian improvements will create destinations and reshape the urban spatial form to be pedestrian focused. Reduce pedestrian/vehicular conflicts through streetscape refinements and enhancements – Improving the streetscape must be paired with the proper street types to create harmony between the pedestrian and the automobile. Because current street widths are oversized, this plan recommends introducing planting buffers between the curb and sidewalk, widening sidewalks and screening parking. These efforts will create the much-needed pedestrian realm along STMC streets. Expand Medical Center employee offerings through development of mixed-use “gateway village” – Establishing a mixed-use development at the core and prominent edge of the campus will add vitality, ensure evening and weekend activity, and provide important services for patients, visitors and staff. Define site planning parameters for integration of world class research park – Distributing and laying out buildings at the research hub in a way that creates a synergy of uses is an opportunity to provide amenities such as retail/dining space, walkways, courtyards, open lawns, open greens, gardens and water features, all of which are attractive to innovative, world-class research institutions. Refocus planning and design emphasis upon human scale (as opposed to vehicular) – Focusing signage, activity hubs and mixed-use development, connectivity, open space, street enhancements and planning efforts to enhance the relationship between the built environment and people’s quality of life will play an important function in connecting buildings, enhancing campus identity, enhancing visual aesthetics, and providing places for activities such as group picnics, outdoor classes, theatrical performances and information recreation. We anticipate major developments to occur with the upcoming Floyd Curl Green Street – a new project that will provide safer, wider sidewalks to benefit all modes of transportation, with emphasis on bikers and pedestrians. 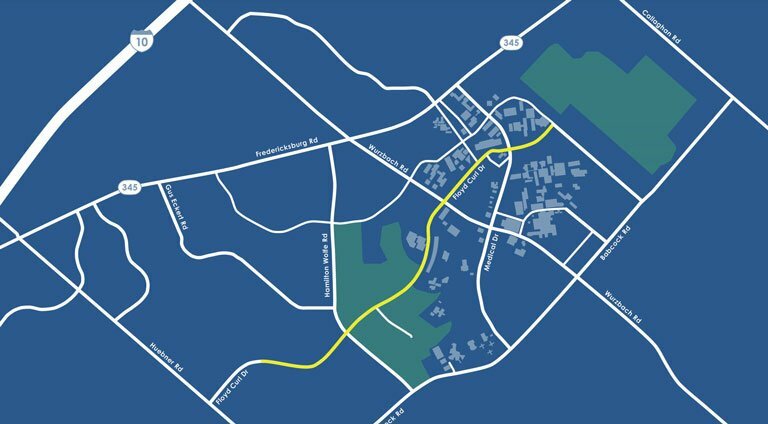 A majority of the improvements will take place near the UT Health Center, helping students and faculty move more safely from campus to campus. The new green street will also include a full cycle track, which will be an off-street, two-way bike facility located on the west side of Floyd Curl. This new addition will move bikers away from busy traffic and provide them with their own stand-alone bike lanes. The east side of Floyd Curl will cater more to pedestrians, providing wider sidewalks that are also at a safer distance from the street. Follow the Medical Center on Facebook or Twitter for regular updates on the project. For a more complete understanding of the STMC Master Plan Update, download the comprehensive brochure here.